The first Denver teacher strike in a quarter century began Monday. Follow along for the latest developments and help tell the story of the strike by sharing what you see with 9NEWS. 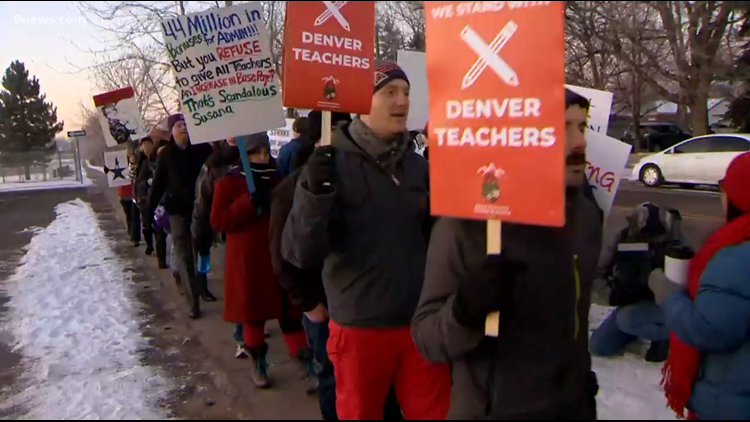 DENVER — After failing to come to a last-minute agreement over the weekend, a strike of Denver teachers is underway for the first time in 25 years. The strike is a culmination of 15 months of back and forth negotiations between Denver Public Schools and the Denver Classroom Teachers Association with the main points of contention being a new pay structure and higher salaries. The district and teachers union spent six hours on Saturday negotiating but were unable to come to an agreement. During the strike, the district's 92,000 students will be taught by substitutes and administration staff brought in to help. Those impacted by the strike are invited to share what’s happening at their schools and what they experience throughout the strike by submitting comments, photos and videos in the live Your Take blog below or by emailing yourtake@9news.com. If you don’t see the Your Take blog below, tap or click here.